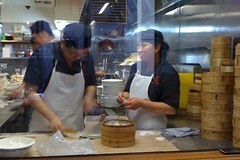 Could these really be the best Xiao long bao (XLB) dumplings in Melbourne? I’m not sure about that but I will go out on a limb here and say these were the best dumplings I’ve ever eaten in a lifetimes worth of Sunday yum cha’s! First recommendation is to make a booking at this one hat restaurant – we rocked up at about 12.30 on a Sunday and had to waited 40 minutes to share a table. Not that I’m complaining – it was well worth the wait, and great a great hangover cure. We sat downstairs which has a more casual vibe, with a great front row view of the magical dumpling making process through the transparent glass that separates the kitchen and dining area. We started with the XLB or Shanghai dumplings (8 pieces $8.50), dipping these little saggy bottomed beauties into Chinese vinegar with ginger dipping sauce. Then the magic eating process – biting a little corner, sucking out the yummy soup then going back for a second dip and popping the little pocket whole down the shoot. 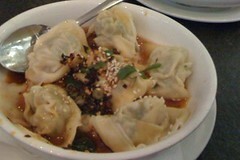 Followed closely buy some delicious steamed Szechuan wontons with hot chili sauce (8 pieces $8.50). Prawn and garlic chive dumplings were also good but more standard yum cha fair. 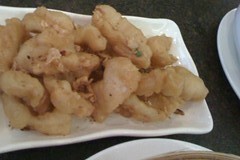 The let down dish was the salt and pepper squid, with a thick fish and chip style batter. I absolutely cannot wait to come back for more, uploading these photos is making my mouth water all over again! How do they get the soup in the dumplings? Contrary to popular belief, there is no freezing involved to get the soup in the dumpling. 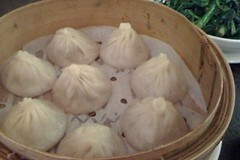 Inside the dumpling are little pockets of gelatinized broth a bit like jelly, which sit neatly around the dumpling meat. When you steam the dumpling, the broth gelatin melts. I was there last week and can attest to your trist with this charming place. Great dumplings, awesome chicken wings and eggplant. **** out of *****!